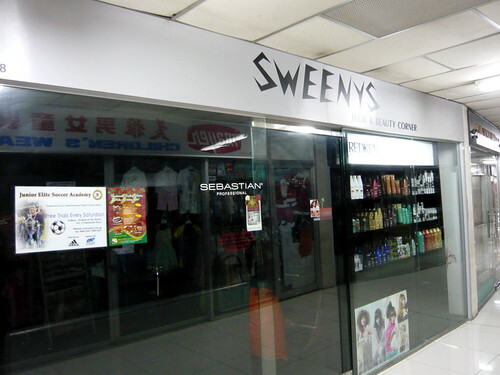 It's a routine for me to head down to Sweenys for my haircut whenever I am back. While it may be weird to some, I only cut my hair here and no where else since 1986. Yeah, even when I was away from Singapore for the last 8 years. Fortunately, I do return every 3 to 4 months and so the length of hair isn't too horrible except that summer in 2006 where I forgo my leave vacation to head up to Provence. What turned out was a year's worth of hair where I was actually able to tie a pony tail. It was a funny story how I chanced on this place back in 1986. A friend of mine and I were heading to Coronation Plaza to get our hair cut after school. And strangely, the whole building blacked out the moment my friend stepped his foot into the salon. As it turned out, it wasn't just the building that suffered the power outage, it was the entire Bukit Timah stretch. He had a day's worth of ribbing from me as a result for being a Suay Kia. Lan lan, we hopped onto the next bus and headed to Holland Village and just pick a salon at random. The rest as they say, was Sweenys history. So in the beginning, I was paying student rate and I grew with them from Secondary 3 to Junior College to National Service (not much hair to cut during BMT) to University to working after graduation. It was student rate all this while with slight adjustments over the years as a result of inflation. Flora (the nice lady who handled my tresses all these years): Eh. Have you graduated already? JayWalk: Er.... yes. Two years ago. Now working liao. Flora: WHAT??!! TWO YEARS!! NO MORE STUDENT RATE FOR YOU LIAO. FROM NOW ON YOU PAY ADULT RATE!! ACT BLUR AH!! Having being through 3 major renovations with them, I grew to love this place very much. Mondays to Saturdays, 0900 hrs to 1900 hrs. sunflower: Not exactly cheating lah. After soooo many years, it just didn't occur to me that I have to pay more when I started working lor coz by the time I reach graduation, I did pay pretty close to adult rate. I thought I had special discount after all the years of patronage mah. corr: 22 to be exact. I ish a sentimental fool. special discount? heh heh. more like special service. msvindicta: Just discount lah. No special service lah!!! AhTiong73: I think by next year, my hair person will be a grandma liao! I thot they were goin to pull down Holland Road Shopping Centre? Btw, show the pic of you with hair long enough for a ponytail. Hee, so lao beng! My brother and I used to go this Malay barber shop behind your kindergarten (Sunrise??) from Sec 1 through Sec 4. I did not like going to the other Indian barber shop on the corner because they always put a lot of gel and oil on my hair. One afternoon (Sec 2??) on our way home after a haircut, we were almost struck by lightnings in a heavy storm near the rear entrance of the old SCGS campus. I was so frightened that I almost peed in my shorts! I could see every hair on my arms and my brother's hair stand up because of the electricity in the air. Yeah, I missed those good old days.